Chinese Recipes by ifood.tv is a free Windows 8 Chinese Recipes app that offer recipes of over 4000 Chinese dishes. 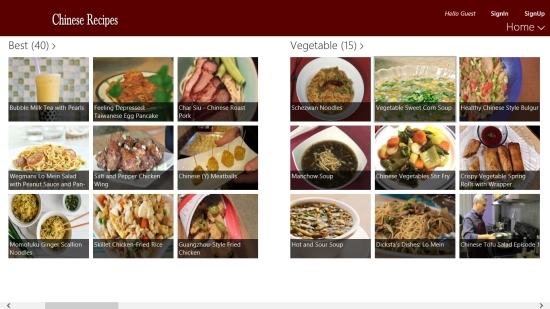 The app brings a variety of Chinese recipes from ifood.tv including noodle recipes, soups, breakfast recipes, main course dishes, desserts, chicken dishes, and more. If you love Chinese taste and enjoy cooking Chinese dishes, then this is the app for you. It provide tutorials on how to make a number of Chinese recipes. Not only the app offer videos of these recipes, but also a detailed list of ingredients and steps wise textual instruction to prepare various dishes given in the app. The nutritional information is also displayed for every recipe mentioned in the app. You can filter recipes based on ingredients, taste, health quotient, shows, method, etc. The filter option makes it convenient to select and view recipes of your choice. The app is freely available in the Food & Dining category of Windows Store. You can also view this app directly in Windows Store using the link given at the end. An active internet connection is required to access recipes from this food app. 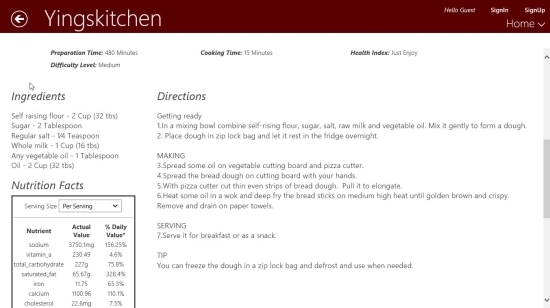 Let’s have a detailed look at how this free Windows 8 Chinese Recipes app works. First, install the app on you Windows 8 system. As you launch the app, you will see the main screen of the app with various categories. Each category will display some dishes as picture tiles with their names. Along with the category, the number of recipes it carries, will also be displayed on the main screen. The categories include, Best, Vegetable, Noodles, Snack, Rice, Desserts, Appetizer, Breakfast, Chicken, Main Dish, Side Dish, and more. You can either view the contents of the app as a guest or sign in through a user account. To sign up, click on SignUp option given on the top right corner of the screen. 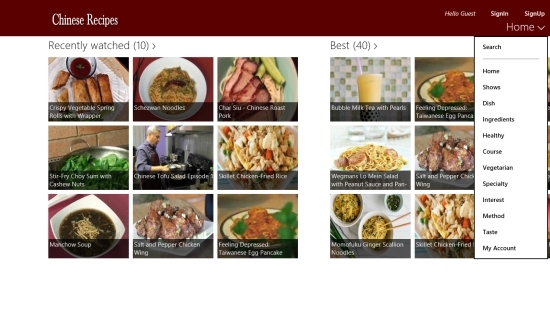 As you click on any of these categories, the next screen will show you the various dishes under that category displayed as picture tiles with names of the dishes. Click on recipe you want to see. A video of that recipe will open up. Click on Play icon to play the video. Preparation Time, Cooking Time, Serving, Health Index, and Difficulty Level will also be mentioned below the video screen. Below this, you will find a detailed list of ingredients, stepwise method of preparation, and nutritional information of that particular recipe. A dropdown top menu is displayed on the top right corner of the screen. You can filter recipes using this dropdown menu as per taste, health quotient, shows, ingredients etc. As you do a right click on the screen, a bottom flyout will appear. This bottom flyout also displays the various filter options. The back arrow icon will take you back to the main screen. You can also switch back to the main screen using the top or bottom menu provided in the app. Also check Dessert Mania and Ice Cream Book. 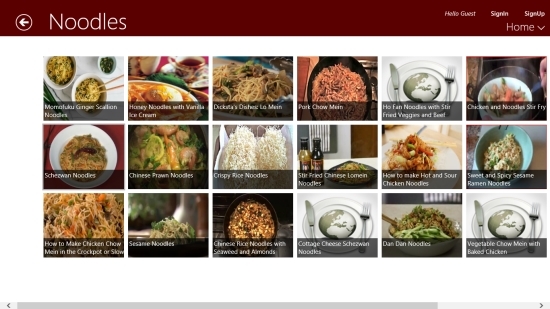 Chinese Recipes is a fantastic free Windows 8 Chinese Recipes app offering recipes of over 4000 Chinese dishes. The video tutorials and textual method of preparation makes it very convenient for the user to learn making these dishes. The nutritional information provided for every recipe adds to the advantage for all health conscious people. However, sometimes the video may take time to load, depending on your internet connection. Do give it a try and share your feedback via comments.